Started the 1st of October and finishing on the 28th Oct 2011, the internationally renowned opera festival “Festival Verdi” is celebrating the composer born in Parma during the month of his birth. This year Italy is celebrating also the 150th anniversary of its unity, and Verdi’s music evokes for each Italian citizen a strong, intense emotion mingling with a patriotic feeling. 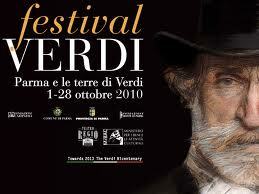 Parma and its Festival Verdi becomes the symbol of a nation very proud to celebrate its history and its roots. The historical town is the incredible scenario in which the festival comes to life: thanks to the Reinassance duchy, the Farnese family, Correggio (1489-1534), the great master of “chiaroscuro”, lived and worked here. In ‘700 the Bourbouns started ruling the town till 1806. In 1816 Parma Napoleon’s wife, Marie Louise, took the city, but the Bourbons on her death regained the power. In 1860 the territory was finally included in the new kingdom of Italy. The international “melomani” and opera fans come here every year in the astonishing beauty of Parma, in the region of Emilia-Romagna, to be entchanted by the grace and the power of opera shows! The beautiful operas chosen to be performed this year are: “Un ballo in maschera”, “Falstaff”, “Aida” as well as the much-loved Requiem Mass. The festival is set in the theatres, opera-houses and other locations in Parma and in Verdi territory, as the composer was born in this extraordinary landscape. But Festival Verdi is not only music, even though music is of course the main star: meaningful cultural events are surronding the performances and the incredible shows on the stage. In 2011 the organisation explores the theme of unity and of Italy unification. The programme includes specific conferences on opera music, and you will find readings from the masterpieces of the Italian and foreign literature which inspired the opera libretti, and many are also the exhibitions related to the main topics. This entry was posted on Thursday, October 20th, 2011 at 1:55 pm	and is filed under Events in Italy. You can follow any responses to this entry through the RSS 2.0 feed. You can leave a response, or trackback from your own site. Thia would be awesome if there was a live conductor. I think that will make the festival special.